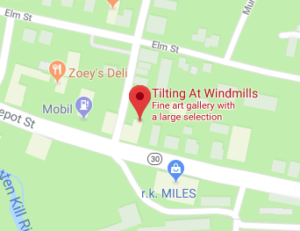 Saturday, February 18th Tilting at Windmills Gallery presented a unique 3 medium ….3 artist show. Diana Cook has evolved to her copper expressions from the training received in Italy and her mural business in New York City to a much different present day creation. Her patience for finite detail is best seen in her exquisite shadow boxes. Diana’s larger patinated copper pieces have been received very enthusiastically and successfully by many collectors. She is a hint of Klimt and yet her own personal sometimes quilt like style prevails, which in some works include paintings. ‘Intriguingly unique’ might best describe Diana’s many works in copper. Also in her show she has displayed some intricate, mixed media and three dimensional shadow boxes. Oil painter Xiao Song Jiang offers yet another very original style. Each one of his painting strokes either with brush or pallet knife in oil, offer a multitude of ranges in hues and texture to produce a very realistic effect. The light and simplicity of his work is very compelling. He was trained in China and lives in Canada but is active worldwide in art shows. 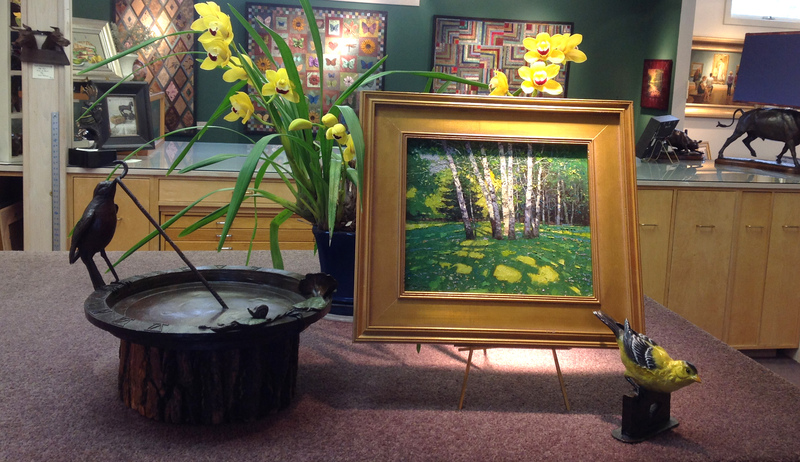 He has earned many awards and is a signature member of the Oil Painters of America.